Blood exposure to polymeric blood conduits initiates the foreign body reaction that has been implicated in clinical complications. Here, the Chandler Loop Apparatus, an experimental tool mimicking blood perfusion through these conduits, is described. Appendage of recombinant CD47 results in decreased evidence of the foreign body reaction on these conduits. Slee, J. B., Alferiev, I. S., Levy, R. J., Stachelek, S. J. 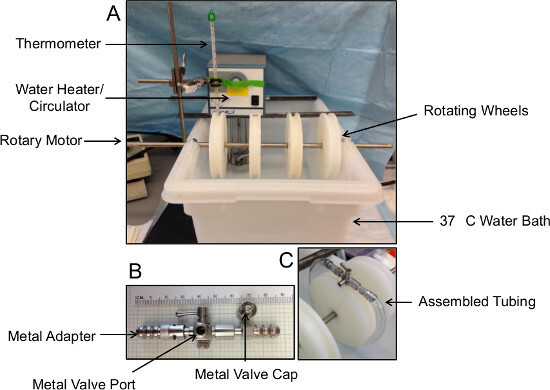 The Use of the Ex Vivo Chandler Loop Apparatus to Assess the Biocompatibility of Modified Polymeric Blood Conduits. J. Vis. Exp. (90), e51871, doi:10.3791/51871 (2014). The foreign body reaction occurs when a synthetic surface is introduced to the body. It is characterized by adsorption of blood proteins and the subsequent attachment and activation of platelets, monocyte/macrophage adhesion, and inflammatory cell signaling events, leading to post-procedural complications. The Chandler Loop Apparatus is an experimental system that allows researchers to study the molecular and cellular interactions that occur when large volumes of blood are perfused over polymeric conduits. To that end, this apparatus has been used as an ex vivo model allowing the assessment of the anti-inflammatory properties of various polymer surface modifications. Our laboratory has shown that blood conduits, covalently modified via photoactivation chemistry with recombinant CD47, can confer biocompatibility to polymeric surfaces. Appending CD47 to polymeric surfaces could be an effective means to promote the efficacy of polymeric blood conduits. Herein is the methodology detailing the photoactivation chemistry used to append recombinant CD47 to clinically relevant polymeric blood conduits and the use of the Chandler Loop as an ex vivo experimental model to examine blood interactions with the CD47 modified and control conduits. Many clinical procedures, such as cardiopulmonary bypass and renal dialysis, require the use of polymeric blood conduits and are often associated with post-procedural complications1. When perfused with blood, these polymers illicit the foreign body reaction (FBR), resulting in adsorption of blood proteins and platelets, monocyte/macrophage adhesion, and the release of pro-inflammatory cytokines, all of which contribute to post-procedural complications and/or device failure2,3. Thus, strategies to address this issue remain an important and ongoing area of biomaterials research. Investigators have attempted to address this issue by modifying blood contacting surfaces with bioactive or bioinert molecules4-6. Research in our laboratory has focused on appending recombinant CD47 (recCD47) to polymeric biomaterials as a strategy to mitigate the FBR and increase the efficacy of these materials. CD47 is a ubiquitously expressed transmembrane protein with a known role in immune evasion, conferring “self” status upon expressing cells7-10 and shows promise at conferring biocompatibility when appended to polymeric surfaces11-13. Signal-regulatory protein alpha (SIRPα), the cognate receptor for CD47, and a member of the immunoreceptor tyrosine-based inhibitory motif (ITIM)-containing family of transmembrane proteins, is expressed on cells of myeloid origin14. We have previously demonstrated that CD47, via SIRPα-mediated cell signaling, down-regulates the immune responses to polyurethane (PU) and polyvinylchloride (PVC) in in vitro, ex vivo, and in vivo models11-13. Central to our investigations is a relatively novel photoactivation chemistry, described herein, in which chemically reactive thiol groups are covalently appended to polymeric tubing by reacting the tubing with a multifunctional polymer (PDT-BzPh), composed of 2-pyridyldithio (PDT), the photoreactive benzophenone (BzPh) and a carboxy-modified polyallylamine11-13. Reducing the covalently appended PDT groups with tris(2-carboxyethyl) phosphine hydrochloride (TCEP)11 yields a thiolated surface that can be subsequently reacted with therapeutic moieties. Detailed herein and previously12,13, recCD47, further modified with the addition of a C-terminal poly-lysine tail12,13, is reacted with Sulfosuccinimidyl-4-[N-maleimidomethyl]cyclohexane-1-carboxylate (sulfo-SMCC) for 1 hr to generate thiol-reactive groups, allowing for a monosulfide bond formation between the tubing and recCD4711. The anti-inflammatory capacity of the CD47 functionalized surfaces was tested, ex vivo, using the Chandler Loop Apparatus with whole human blood, which was originally described in 1958 as an in vitro model of thrombotic coagulation15. The apparatus relies on a closed tube system partially filled with air and a rotary motor to circulate the blood through the tubing15. This experimental model provides the opportunity to examine the effect of blood exposure upon modified and unmodified surfaces as well as the effect of those surface modifications upon the physiology of cells of the blood. recCD47 can be appended to a variety of polymeric surfaces using this photoactivation chemistry, and its anti-inflammatory capacity can be assessed by utilizing a clinically relevant ex vivo model mimicking blood perfusion over polymeric surfaces11,12. Clinical grade blood conduits modified with recCD47 show significantly less platelet and inflammatory cell attachment as compared to unmodified polymers when exposed to human blood in the apparatus. A step-by-step description of this modification process is detailed below. NOTE: The protocol is summarized schematically in Figure 1. Figure 1A illustrates generation of thiol-reactive polymeric surfaces. Figure 1B illustrates generation of thiol-reactive recCD47. Prepare a solution of PDT-BzPh (1 mg/ml) and potassium bicarbonate (KHCO3) (0.7 mg/ml) in sterile water. Stir overnight at 4 °C (protect from light). Cut polymeric tubing into 40 cm long pieces (long enough to fit around rotating wheels). Soak tubes in a 0.1% aqueous solution of hexacylpyridinium for 90 min at room temperature on a shaker or on Chandler Loop Apparatus. Rinse the tubes with sterile water 3x after the 90 min soak. Acidify the solution of PDT-BzPh from Day 1 by adding 15% aqueous potassium phosphate monobasic (KH2PO4). Add 50 µl KH2PO4 per ml of PDT-BzPh, forming a cloudy micellar solution. Soak the tubes in the acidified PDT-BzPh solution for 40 min at room temperature on a shaker or on apparatus. Rinse the tubes with dilute acetic acid (1:1,000) once. Expose the tubes to UV irradiation for a total duration of 60 min. Rotate tubes ¼ turn every 15 min to irradiate the entire surface area. Soak the tubes in a solution of 20 mg/ml potassium bicarbonate (KHCO3) for 20 min at room temperature on a shaker or on apparatus. Rinse the tubes with sterile water 3x and store at 4 °C in sterile water. Dissolve 5 mg Sulfo-SMCC in 200 µl Dimethylformamide (DMF) (Caution: Perform in fume hood). Add 50 µl of the Sulfo-SMCC solution prepared in step 1 to 0.1 mg/ml of recCD47 poly-lysine solution, and stir for 60 min at room temperature. During 60 min stir, degas sterile Dulbecco’s Phosphate Buffered Saline (DPBS) and set aside. Purify Sulfo-SMCC reacted recCD47 using a 7K molecular weight cut-off spin desalting column per manufacturer’s instructions. Collect final flow-through (high-quality thiol-reactive recCD47) and dilute to a volume necessary to coat the interior of the tube with DPBS. Rinse the tubes from day 2 with sterile, degassed DPBS 3x. React the modified surface of the tubes with a solution of 20 mg/ml with tris(2-carboxyethyl) phosphine hydrochloride (TCEP) in degassed DPBS for less than 2 min. Rinse the tubes with sterile degassed DPBS 4x. Add the Sulfo-SMCC-reacted recCD47 to the tubes and incubate overnight at 4 °C on a shaker or on apparatus. Rinse modified tubes to be quantified from Day 3 with DPBS 3x. Store tubes not used for quantification in DPBS at 4 °C. Use a 4 mm biopsy punch to make duplicate tube samples and place biopsy punches in wells of a 96-well plate. Prepare a negative control consisting of an unmodified tube sample not treated with the detection antibody. Prepare an antibody control consisting of an unmodified tube sample treated with the detection antibody. Prepare the modified tubing test samples treated with the detection antibody. Block samples with 0.4% bovine serum albumin (BSA) in DPBS for 60 min at room temperature on a shaker. After blocking, aspirate BSA and rinse with tris-buffered saline plus 1% Tween-20 (TBST) 3x, 10 min each on a shaker. Prepare a working dilution of antibody in 0.4% BSA according to manufacturer’s recommended dilution for immunoassays. Dilute human CD47 Antibody B6H12-FITC 1:100 in 0.4% BSA. Add 200 µl of antibody dilution to appropriate wells. Incubate negative controls with 0.4% BSA only. Incubate at room temperature for 60 min on a shaker (protect from light). Rinse with TBST 3x, 10 min each on a shaker. Aspirate the last TBST rinse and add 200 µl DPBS to tube sample wells. Collect the final flow-through, which is high-quality thiol-reactive recombinant CD47 and dilute to a volume necessary to coat the interior of the tubes with DPBS. Read FITC signal intensity using a microplate reader with FITC excitation (485 nm) and emission (538 nm) settings. Calculate recCD47 bound to polymeric surface based on standard values, accounting for auto-fluorescence and non-specific binding from the antibody control sample. Seek Institutional Review Board (IRB) approval of blood collection protocol and informed consent paperwork prior to initiation of collection of human blood samples. Obtain informed consent from a human blood donor. NOTE: A diagram depicting the apparatus is shown in Figure 2. Fill water bath with distilled water until approximately 1/2 of the diameter wheels are submerged. Add enough bleach to the water bath to make a 10% bleach solution. Set water bath to 37 °C and allow temperature to equilibrate. Gather metal adapters (shown in Figure 1B), unmodified tubing and modified tubing, and assemble around apparatus wheels, as shown in Figure 1C. Ensure that tubing fits snuggly around the wheel with the metal adapter in place. Obtain 30 ml blood sample using an IRB-approved protocol, in a vial prefilled with 2 ml of citrate or other anticoagulant, and mix by inversion to prevent clotting once the specimen has been collected. Add approximately 10 ml of blood to each tube using the metal valve and syringe, leaving some air in the tube. Secure the valve cap and rotate for 3 hr. Drain the blood into a waste beaker treated with a 10% bleach solution (or as required by institutional policy). Gently rinse tubing interior with DPBS to remove all traces of blood. Collect flow-through in the waste beaker. Dispose of blood in accordance with institutional policy. Disinfect the apparatus and any blood contacting surfaces using a 10% bleach solution or according to institutional policy. Process samples for fluorescent microscopy or scanning electron microscopy as described below. Prepare a 4% paraformaldehyde (PFA) solution (Caution: Perform in fume hood). Incubate tubing in a 4% PFA solution overnight at 4 °C. After overnight incubation, remove 4% PFA and rinse films very gently with DPBS. Cut the tubing into sections to expose the lumen surface for staining. Stain a section of the tubing with a few drops of mounting media with 4',6-diamidino-2-phenylindole (DAPI) for 30 min at room temperature (protect from light). After staining, rinse the tubing very gently with DPBS to reduce background DAPI signal. Image using a fluorescent microscope equipped with a DAPI filter and digital camera to count the number of cells in 9 blindly selected fields of view under 200X magnification. Record cell counts per field of view and perform appropriate statistical analyses to determine statistical significance of results. Prepare a 2% glutaraldehyde solution (Caution: Perform in fume hood). Incubate tubing in a 2% glutaraldehyde solution overnight at 4 °C. After overnight incubation, gently rinse the tubing 3x with DPBS. Prepare a 1% solution of osmium tetroxide (Caution: Severe inhalation hazard! Use in fume hood). Incubate tubing in a 1% solution of osmium tetroxide for 15 min at room temperature. Gently rinse the tubing 3x with DPBS. Prepare a series of ethanol concentrations (25%, 50%, 75%, 95%, and 100% ethanol). Dehydrate the tubing by incubation in the series of ethanol concentrations. Incubate in 25%, 50%, 75%, and 95% ethanol for 20 min each. Incubate in 100% ethanol for 30 min. Supercritical point dry the tubing with CO2 for 45 min to remove all moisture. Mount tube sections on a specimen stub with silver paste or graphite. Coat tube sections with 12.5 nm of gold-palladium. Examine in a scanning electron microscope. Generating thiol-reactive polymeric surfaces through the use of PDT-BzPh and TCEP along with thiol-reactive recCD47 poly-lysine using SMCC allows for the attachment of recCD47 to polymeric surfaces. The modification process is summarized schematically in Figure 1. The convenience of this modification process is that it can be applied to many different proteins and many different polymeric surfaces, assuming the protein can be modified with sufficient chemically reactive groups such as amine-containing lysines and that the polymer has sufficiently available hydrocarbons. It has been demonstrated previously that recCD47 can be appended to polymeric surfaces using this protocol11-13. As shown in Figure 3A, significant FITC staining is visible for recCD47, using a FITC-conjugated antibody to the extracellular Ig domain of CD47, which is localized specifically to the film as shown by DIC imaging (Figure 3B). These results demonstrate that recCD47 can be covalently attached to polyurethane films. Measuring the fluorescent units and comparing with a standard curve determined the concentration of surface bound recCD47. We have shown that recCD47 can be appended to polymeric surfaces at levels exceeding 500 ng/cm2,11-13. These results confirm that this thiol-based polymer modification protocol can be used to append poly-lysine modified recombinant proteins to polymeric surfaces. CD47 has been shown to be a marker of “self,” preventing inflammatory cell attachment and immune system activation7-13. To mimic in vivo conditions as closely as possible in an ex vivo setting, whole human blood can be perfused through unmodified and modified polymeric tubing in the Chandler Loop Apparatus (shown in Figure 2). Cell attachment to the tubing can be assessed via DAPI staining (Figure 4) and SEM (Figure 5). 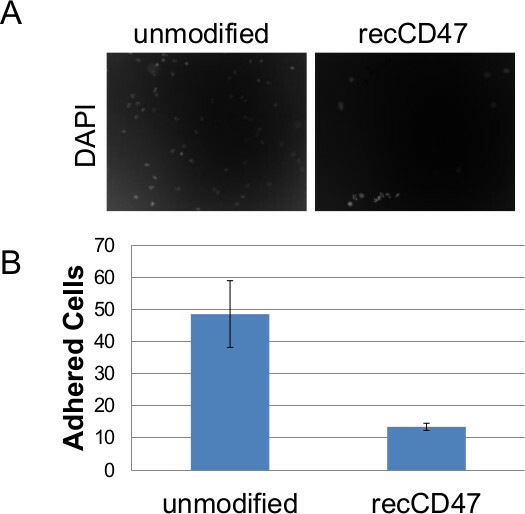 Cell counts obtained through DAPI staining demonstrate that appended recCD47 significantly (p = 0.004) inhibits cell attachment compared to unmodified surfaces (Figures 4A & 4B). The DAPI cell counts were confirmed by SEM, demonstrating similar levels of cell attachment to unmodified and recCD47 modified surfaces (Figure 5). These data indicate that appendage of recCD47, using the protocol described herein, significantly inhibits inflammatory cell attachment in an ex vivo model of blood perfusion. Figure 1. Schematic of Surface modification. A) Thiolated polymer surfaces were generated by incubating the polymeric surface with the photoactivatable crosslinker PDT-BzPh and subsequent reduction with TCEP. B) SMCC was used to produce thiol-reactive recCD47, which was then reacted with the thiolated synthetic surface to yield recCD47 functionalized surfaces. Figure 2. Diagram of Chandler Loop Apparatus. A) The apparatus consists of a water bath heated to 37 °C, rotating wheels fixed on a metal pole attached to a rotary motor. This set up allows for the rotary motor to turn the wheels, thereby submersing portions of the tubing into the 37 °C water bath and perfusion of blood through the tubing. B) Metal adapters are used to connect the ends of the tubing forming a loop around one of the rotating wheels. Blood is added to the tubes through the metal valve port and capped with the valve cap. C) Once assembled, the tubing and metal valve should fit snuggly around the rotating wheel, as shown here with an empty tube. Figure 3. Quantization of recCD47 on polyurethane films. Antibodies directed against the external Ig domain of CD47 were used to quantify the amount of recCD47 bound to polyurethane films. Fluorescent microscope images taken under 200X magnification with appropriate filter sets showing FITC detection of recCD47 appended to polyurethane (A). (B) DIC images show that FITC signal is specific to the polyurethane film. Figure 4. Cell adhesion to unmodified and recCD47-modified polyurethane. Whole human blood was collected and perfused over unmodified or recCD47-modified PU films for 3 hr. Following the 3 hr perfusion, films were rinsed with DPBS, and the adhered cells were fixed with 4% PFA overnight at 4 °C and DAPI stained for 30 min at room temperature. DAPI-stained cells were counted using a fluorescent microscope under 200X magnification and appropriate filter sets. (A) 9 randomly selected fields of view were counted for each modification. (B) Data is representative of 9 fields of view and is expressed as mean ± standard error (p = 0.004). Figure 5. SEM analysis of recCD47 modified and control surfaces following ex vivo analysis. Whole human blood was collected and perfused over unmodified or recCD47-modified PVC tubing for 3 hr. 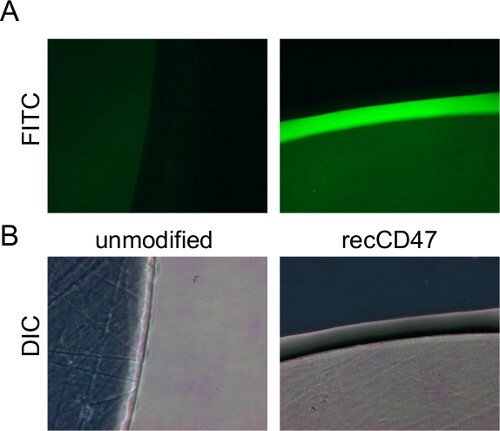 Representative images show significant cell attachment to unmodified surfaces while recCD47-modified surfaces show only an occasional attached cell. The photoactivation chemistry (summarized in Figure 1) allows for the modification of virtually any polymer surface that has sufficient hydrocarbons to facilitate PDT-BzPh attachment and subsequent UV irradiation to photo-activate the PDT-BzPh. Functionalizing the polymeric surface with reactive thiol groups allows for the subsequent attachment of a range of testable molecules of interest. In our particular studies we chose recombinant CD4711-13. The particular conjugation chemistry that we used involved the reaction of the protein’s amine groups with the bifunctional cross linker SMCC11-13. This provided thiol-reactive recCD47 for the subsequent reaction with the thiolated polymeric surface. The end product was a mono-sulfide linkage covalently binding the recCD47 to the polymer. 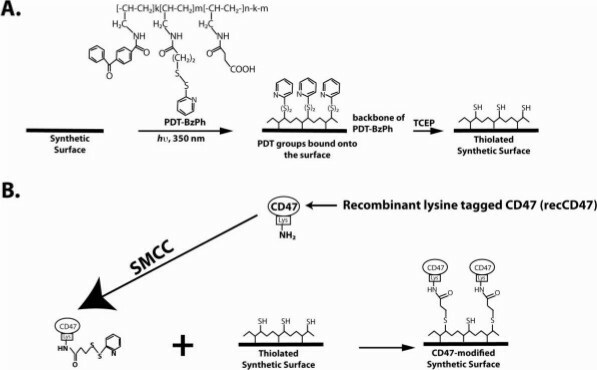 To help ensure that the amine groups from the amino acids in CD47 were not being used for the reaction, and thereby mitigating the efficacy of the immobilized CD47, we further modified the recCD47 by inserting a poly-lysine tag at the protein’s C-terminus. It would be feasible that a similar molecular strategy can be applied with other proteins. Thus the conjugation chemistry presented here and elsewhere11-13 provides an important opportunity to assess the ability of potentially therapeutic molecules to confer biocompatibility upon synthetic surfaces. A disadvantage to this protocol is that exposing certain types of polymers, such as polyurethane, to extended periods of UV irradiation can result in discoloration. This can be avoided by placing the polymer in polystyrene dishes (commonly used in tissue culture) to prevent discoloration of the polymer without hindering photoactivation of the PDT-BzPh. The wavelength of UV light used in this protocol is 302 nm; deviation from this wavelength can result in inefficient photo-activation of PDT-BzPh. If using a different wavelength of UV light, optimization of UV exposure time is necessary to ensure significant photo-activation. Following this protocol allows for the attachment of recCD47 to polymeric surfaces, for the purpose of immune evasion and conveying “self” status to the polymeric surface to prevent the foreign body reaction. Quantification of the recCD47 appended to the surface is completed using a FITC-labeled antibody to the Ig domain of CD47 using an immunoassay and fluorescent microscopy (Figure 3). This methodology could be adapted to other proteins appended to polymeric surfaces assuming antibody availability. Failure to obtain significant appendage of recCD47 (or other protein) could be due to a variety of factors including, failure to photoactivate PDT-BzPh, insufficient free hydrocarbons on the polymer surface, hydrophobicity of polymer surface, or the polymer could be too thick or opaque to allow light to pass through for adequate quantification. All of these variables can be experimentally tested and optimized for a particular polymer. The Chandler Loop Apparatus is a unique tool for the ex vivo analysis of whole human blood exposure to polymeric surfaces. This system closely resembles the perfusion of blood through clinical blood conduits used in various medical procedures, enabling the analysis of many physiological endpoints associated with blood contacting surfaces. As physiological endpoints for the appendage of recCD47 to polymeric surfaces, cell counts using DAPI staining (Figure 4) and scanning electron microscopy (Figure 5) were used. Other endpoints can also be used, depending on equipment availability, for example, cell counts before and after blood perfusion through polymeric blood conduits could also be used. Regardless, recCD47-modified surfaces exhibited significantly less adhered cells compared to unmodified control surfaces. These data suggest that recCD47 conveys biocompatibility to polymeric surfaces and could potentially be used to prevent the FBR in clinical procedures using polymeric blood conduits. Although this is a widely used in vitro model for blood perfusion studies, it is limited in some respects. The two major disadvantages of this method arise from the requirement to include air in the tube with the blood sample. The frequent blood interaction with air can cause leukocyte and platelet aggregation and protein denaturation16-18, which may interfere with certain endpoints. Secondly, the air remains at the highest point of the circuit, limiting the rate of blood circulation19. Despite the apparent limitations of this method, it induces less blood damage than competing methods19 and serves as a way of screening the biocompatibility of potential biomolecules on polymeric blood conduits. Once candidate biomolecules are identified through this method, further analysis can be obtained through in vivo animal models. Ultimately, the biocompatibility of modified polymers needs to be confirmed using a suitable in vivo model system. Research reported in this publication was supported by National Institute of Biomedical Imaging and Bioengineering, under award number R21 EB015612 (SJS), and the National Heart, Lung, and Blood Institute, under award number T32 HL007915 (JBS and RJL), of the National Institute of Health. Sulfo-SMCC Sigma M6035-10MG Moisture Sensitive! Vectashield with DAPI Fisher Scientific H-1200 Light sensitive! Bruck, S. D. Medical applications of polymeric materials. Med. Prog. Technol. 9, (1), 1-16 (1982). Anderson, J. M., Rodriguez, A., Chang, D. T. Foreign body reaction to biomaterials. Semin. Immunol. 20, (2), 86-100 (2008). Levy, J. H., Tanaka, K. A. Inflammatory response to cardiopulmonary bypass. Ann. Thorac. Surg. 75, S715-S720 (2003). Sperling, C., Maitz, M. F., Talkenberger, S., Gouzy, M. F., Groth, T., Werner, C. In vitro blood reactivity to hydroxylated and non-hydroxylated polymer surfaces. Biomaterials. 28, 3617-3625 (2007). Sperling, C., Schweiss, R. B., Streller, U., Werner, C. In vitro hemocompatibility of self-assembled monolayers displaying various functional groups. Biomaterials. 26, 6547-6457 (2005). Vasita, R., Shanmugam, I. K., Katt, D. S. Improved biomaterials for tissue engineering applications: surface modification of polymers. Curr. Top. Med. Chem. 8, 341-353 (2008). Subramanian, S., Parthasarathy, R., Sen, S., Boder, E. T., Discher, D. E. Species- and cell type-specific interactions between CD47 and human SIRPalpha. Blood. 107, (6), 2548-2556 (2006). Tsai, R. K., Discher, D. E. Inhibition of 'self' engulfment through deactivation of myosin-II at the phagocytic synapse between human cells. J Cell Biol. 180, (5), 989-1003 (2008). Berg, T. K., vander Schoot, C. E. Innate immune 'self' recognition: a role for CD47-SIRPalpha interactions in hematopoietic stem cell transplantation. Trends Immunol. 29, (5), 203-206 (2008). Oldenborg, P. A., Zheleznyak, A., Fang, Y. F., Lagenaur, C. F., Gresham, H. D., Lindberg, F. P. Role of CD47 as a marker of self on red blood cells. Science. 288, (5473), 2051-2054 (2000). Stachelek, S. J., et al. The effect of CD47 modified polymer surfaces on inflammatory cell attachment and activation. Biomaterials. 32, (19), 4317-4326 (2001). Finley, M. J., Rauva, L., Alferiev, I. S., Weisel, J. W., Levy, R. J., Stachelek, S. J. Diminished adhesion and activation of platelets and neutrophils with CD47 functionalized blood contacting surfaces. Biomaterials. 33, 5803-5811 (2012). Finley, M. J., Clark, K. A., Alferiev, I. S., Levy, R. J., Stachelek, S. J. Intracellular signaling mechanisms associated with CD47 modified surfaces. Biomaterials. 34, 8640-8649 (2013). Ravetch, J. V., Lanier, L. L. Immune inhibitory receptors. Science. 290, 84-89 (2000). Chandler, A. B. In vitro thrombotic coagulation of blood: a method for producing a thrombus. Lab Invest. 7, 110-114 (1958). Thorsen, T., Klausen, H., Lie, R. T., Holmsen, H. Bubble-induced aggregation of platelets: effects of gas species, proteins, and decompression. Undersea Hyperb Med. 20, (2), 101-119 (1993). Ritz-Timme, S., Eckelt, N., Schmidtke, E., Thomsen, H. Genesis and diagnostic value of leukocyte and platlet accumulations around “air bubbles” in blood after venous air embolism. Intl J of Legal Med. 111, (1), 22-26 (1998). Miller, R., Fainerman, V. B., Wüstneck, R., Krägel, J., Trukhin, D. V. Characterization of the initial period of protein adsorption by dynamic surface tension measurements using different drop techniques. Colloids and Surfaces A. 131, (1-3), 225-230 (1998). Oeveren, W. V., Tielliu, I. F., de Hart, J. Comparison of modified chandler, roller pump, and ball valve circulation models for in vitro testing in high blood flow conditions: application in thrombogenicity testing of different materials for vascular applications. Int J Biomater. 2012, (2012).